Crooked Lane Books, 9781683317302, 352pp. Sweet treat fans of JoAnna Carl and Joanne Fluke will be pining for Dorothy St. James' decadent follow-up to Asking for Truffle. 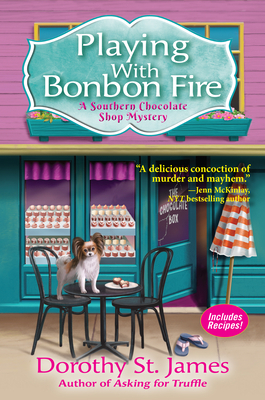 Chocoholic Charity Penn must smoke out the killer to stop her newly inherited beachside chocolate shop from going up in flames. Chocolate shop owner Charity Penn is finally settling into life in the quirky South Carolina seaside town of Camellia Beach cooking up chocolate treats. She's even helped organize the town's lively beach music festival which has brought rollicking crowds eager to dance the Carolina shag. That is, until one of the band's lead singers is found dead beside a beach bonfire. While also trying to balance the amorous attention of music star Bixby Lewis, in town for the festival, and her quest to perfect a new hot flavored bonbon, Charity dives into the investigation. Though it's more spice than sugar when she discovers a threatening note, comes across decades of age-old secrets, and Bixby comes into the line of fire when a gas grill explodes on the deck of a beachfront house. Dorothy St. James is the author of the White House Gardener mysteries. For the past twenty years she made her home on Folly Beach, an artsy island community in South Carolina with her sculptor husband. Dorothy is a member of Mystery Writers of America (MWA) and the International Thriller Writers (ITW). This is her second Southern Chocolate Shop mystery.